There has been an ongoing and growing interest in the life and work of the Scott Sisters of Ash Island. Harriet (1830-1907) and Helena (1832-1910) Scott were the talented daughters of Alexander Walker Scott (1800-1883) and his wife Harriet (c.1802/3 – 1866). I have assembled everything to date (i.e. September 2014) that I can find on the property and its location on Ash Island. We hope to be able to sponsor a return of our 3D Artist Charles Martin to recreate the Islands of the Hunter River estuary and the homestead of A.W. Scott in the coming months. Why so inspiring? Well, these two young girls were deprived of a University education, but, under the tutelage of their scientist father, they were educated as young scientists on Ash Island and became scientific observers and illustrators of the natural life of insects par excellence on a world class level. They collected specimens that were donated to the Australian Museum, and assisted in the mapping of species of flora and fauna across the country. The site where all this work was undertaken now lies abandoned and has been reclaimed by the mangroves and the reeds. Their lives now haunt the rustling of the wind among the reeds that now engulfs the location of their homestead and cultivated lands of orange trees that were once famous as “Ash Island Oranges”. Such a place should be regarded as an intellectual sacred site, and should be remembered and regarded with respect, not neglected. The homestead was demolished sometime in the 1970s-80s, and one must wonder why. The Scott Sisters recorded the Lepidoptera (the insect family including moths and butterflies) in their caterpillar, chrysalis and perfect state (aka butterfly). It was experiencing the work of artist Shan Turner-Carroll’s beautiful chrysalis dress made me think of the Ancient Egyptians and what they were doing in the mummification process, cocooning their dead for their transformations into a new perfect state, like a butterfly. If we are part of nature, then those drawings and illustrations also can tell us something about our shape of life on earth. Do we undergo a similar transformation? This butterfly symbolism really hit me following the recent Ash Island and Its Transformations exhibition at the Lockup Cultural Centre. Ash Island”, or “Scotts Island”, was the name, given to the largest island at the western end of the Hunter River delta. 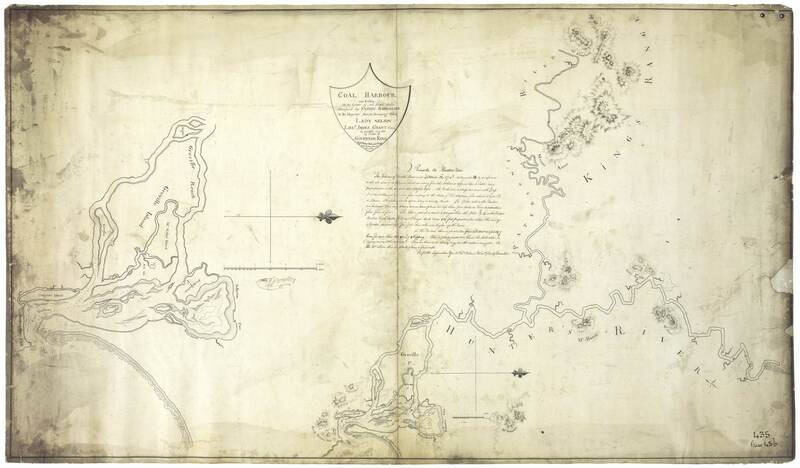 The name, Ash Island, was its first title (and is so today) [Ed:- In the original 1801 survey today’s Ash Island that Paterson is referring was at the location of Moscheto Island. The current Ash Island was named Greville Island by the original survey mission. Around 1823-4 its name changed from Greville to Ash, and has remained Ash Island since then. See the 1801 Barrallier Plan] and was given because of the trees that grew there that so resembled the English Ash. (20) The island received its alternate name because it was the location of the grant, of 2560 acres, to A.W. Scott (21) following his arrival in the Colony. As with most other houses in the Valley erected in the early period, little information exists concerning the house Scott erected on his island. The house has long been demolished but the remains of its cellars are discernable on the extreme north western tip of the island, adjacent to a large Moreton Bay Fig tree and a fallen pine laying in the mud of the bank. The foundation walls, some paths and the foundations of some of the out buildings still exist. Their excavation would allow a comparison of the house plan with some of those prepared by Robert Scott (22) of “Glendon” so as to determine whether he was the designer of the building. “Newcastle House” was advertised for sale by auction (29) in July, 1848 and the advertisement described it as being constructed of brick and containing eight rooms, stewards closet, kitchen, storerooms , and servants quarters. Outhouses were provided for stables, coachhouse and men’s quarters, the whole surrounded by a garden which was enclosed by a parapet brick fence. That Scott was prepared to erect a house on the island is almost unbelievable, as the site he chose is but 2′ 6″ above high water mark and is subject to inundation by a good fresh combined with a spring tide. 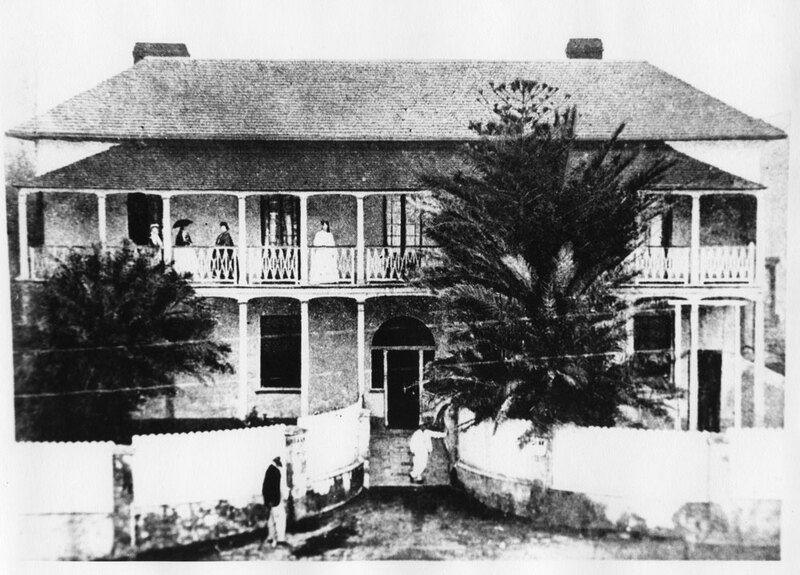 The writer has contacted persons who resided in the house and the descendants of other residents of Ash Island to ascertain if any photographs existed of the old house, but was informed that all the photographs the various persons had had were lost in one or other of the floods that plague the island. A.W. Scott was an enterprising gentleman who not only engaged in agricultural pursuits but also entered into industry. Reporting on his interests, an article in the “Maitland Mercury” of 7th January, 1843, stated that he owned an extensive iron foundry which was then casting a six hundred gallon boiler for the Maitland Brewery. His salt works were extensive and producing an excellent salt and his cloth manufactory was mainly complete. The ironworks was located on the Stockton Peninsular, or as it was then known, “Pirates Point”, and were ultimately sold to John Roberts of South Australia as reported in the “Maitland Mercury” of 2nd October, 1847. The “Maitland Mercury” of 16th July, 1851 also reported that Scott’s cloth factory which was known as the Stockton Tweed Factory was destroyed by fire. Although Scott’s industrial enterprises were to founder, his farm was reasonably productive, as can be gleaned from the advertisement in the “Maitland Mercury” of July, 1847 which informed the public that he had for sale on Ash Island 70 tons of salt, 100 tons of Lucerne Hay, 8000 dozen oranges and 10 tons of pumpkins. The island , that was once an obviously fertile area, is now mostly marsh and most of the many families who once won their living from its soil have abandoned it and left it to the mud crabs. 20. Paterson, Lieut.Colonel, “Journal and Discoveries at Hunter River”, 17th June, 1801. p.449, Vol., 3, Historical Records of N.S.W. 21. Dangar, Henry • “A Guide to EmmiiD:”ants and Index and Directory of the Hunter River”, 1828. also Dixon Map 1834. Mitchell Library. 22. Scott, Robert. Plans of Farm Buildings, 1828 to 1835. Mitchell Library. 23. Scott Family Papers, Mitchell Library. also MacArthur Papers, pp.358-360. Vol. 15, 18th July, 1826, John Jnr. to his father, John MacArthur. Mitchell Library. 24. Scott Robert, Correspondence of ••• ,Scott Family Papers, Mitchell Library. 25. Boydell, Charles, Journal and Cash Book of ••• , 1830 to 1835. Mitchell Library. 26. Scott, Robert, Co~respondence of ••• ,Vol. IV, Scott Family Papers, Mitchell Library. 27. Scott Family Papers, Mitchell Library. 28. Goold, W.J. “These Old Homes”, pp.l64-165, Part III. Newcastle and Hunter District Historical Society Journal. The known illustrations and visitor descriptions (to date) depicting the site. This background scene accompanying original plate XXXIX (39) appears to be Scott’s Ash Island homestead. 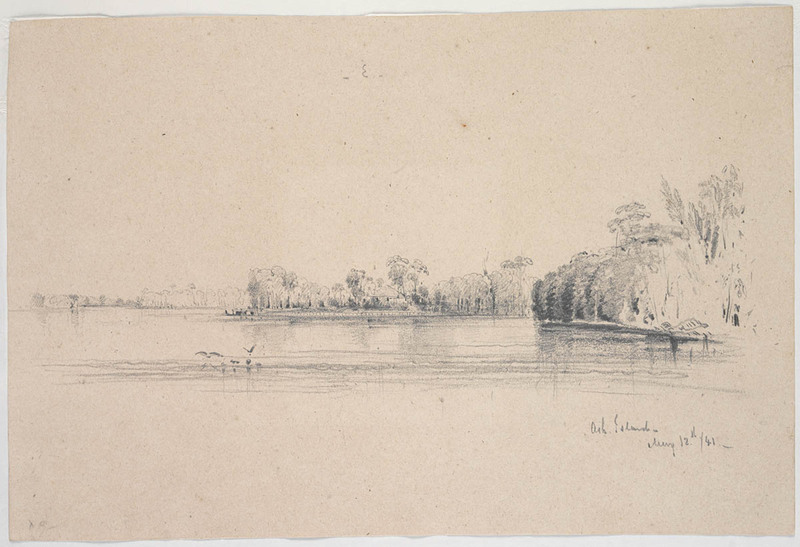 Compare this view with Conrad Martens’ 1841 sketch completed on the 12th May 1841. LUDWIG LEICHHARDT’S descriptions of Ash Island during his visit to Newcastle in 1842 from his letters published in The letters of F.W. Ludwig Leichhardt collected and newly translated [from the German, French and Italian] by M. Aurousseau (London : Published for the Hakluyt Society by Cambridge University Press, 1968). Mr Scott has kindly offered us his place at Ash island, as I wrote you last time. I’ve been to Ash Island twice. The first time was in company with ladies, who got badly in the way of my scientific activities. The second time I went with Mr Scott, in connection with his interests, which left us no time for studious pursuits. It’s a romantic place, which I like well enough to think that-perhaps-I’d be content to live and die there. I said perhaps, for who knows himself well enough to be sure? Which of us could stifle his perpetual longing for what merely seem to be better conditions? Were I living on Ash Island, or even in a settler’s bark shanty, I could do more for entomology that I can in Newcastle. But even in Newcastle there will be a good deal for me to do, when I manage to satisfy some of my curiosity in other directions. 21 October 1842. Leichhardt visits Ash Island with Lynd, W. Scott and – Bolton. I decided to use the steamer to undertake an excursion to the north as well as the south. Mr. Alex. Walker Scott, 10 a keen entomologist, had kindly invited me to his property, Ash Island, in the Hunter River to which the Maitland steamer departed from Sydney on 9 November at 11 o’clock. 11 The next morning we steered into the mouth of this river at 6 o’clock. Within this entrance lies Newcastle, which as far as the important fossil fuel [coal] is concerned, appears to be the fortunate rival in the Antipodes of its namesake. From there after an hour’s trip upstream we reached Hexham, the first post station on the Hunter, where the railway constructed from Newcastle to Maitland also passes by. I left the steamer there and sailed by boat to the island opposite, the destination of my journey. The landscape of the river is unattractive. On the cleared banks, whose woodland remnants of dead eucalypts stand scattered ghostlike on the flat fields planted with crops, one catches sight, here and there, of the poor wooden huts of the settlers, whose cattle graze all around in the fenced paddocks. Sterna melanorhyncha, as well as Pacific Gulls (Larus pacificus) skim up and down over the river fishing. The great New Holland Eagle (Aquila fucosa), moves along the banks high in the air, while countless Cormorants sit fearlessly on the bleached, white branches of the dead trees. Here and there on the sand banks a pair of the readily recognisable Long-beaked Oyster Catchers was busy. I was not able to distinguish the busy, cheeping Strand Plover running about between them. The attractive island [Ash Island], on which Mr. W. Scott’s idyllic home is located, diffuses far and wide an exquisite fragrance from the abundance of perfumed flowers in the well-kept garden and extensive orange grove. Not only the kindness of the whole family of the owner, who made the stay there unforgettable for me, but also the scientific entomological studies of both daughters12 of the house undertaken with enthusiasm also afforded me great interest; likewise the excellent execution of illustrations of the same merited admiration. For a large number of species they have determined the Lepidopteran fauna of New South Wales completely through all states of metamorphosis, often from the egg onwards, and their experiences of a substantial part of the Australian macro- and micro-Lepidopterans are captured and documented in a series of more than 100 folio plates. The strange genus, Oiketicos, which bores itself a dwelling in the branches of the New Holland Proteaceae and Myrtaceae, the opening of which is surrounded with a thick cocoon like a bag and from where they emerge at night to feed, as well as the case / cocoon-bearing Psychiden and Tineiden, of which New Holland has so many, are represented in great number. Apart from several brought by Sir Thomas Mitchell from the inland, up till now the Cystosoma Saundersii was only found on this island in the Hunter River, but there in great number. On warm, still evenings, a half an hour after sunset, males begin a loud purring song for a quarter of an hour, which sounds duller and deeper and not nearly as cuttingly shrill as for real Cicadas. The creature is far lazier and easy to fasten on to. The back half looks like an empty, wind-filled bubble, which appears to serve as the resonance for the singing organ. The next day I intended to visit the Sugarloaf, the highest mountain in the area, 3,288 feet high. It was a good ride of almost 40 miles, which I put behind me in a day and for which I set out early from Ash Island, accompanied by two settlers. For half an hour we followed the Hunter River upstream; it then turned right NE, while we went left into the mountains. The forest, perhaps somewhat more cleared than it originally would have been, since extensive traces of fire indicated frequent bushfires, is so sparse that one can ride through almost without hindrance. Even formerly, it could not have been much more dense, since no remains of older, thicker woodlands existed, and in those places where fire and man had not been at work, the forest appeared just as thin and open. Here and there, we came upon huts and cultivated areas; the large landowners lease individuals such tracts or have livestock with their own overseers there. Even in winter the animals can be left to their own devices, where, in the Bush – as the settlers typically call this wooded district – they find the most luxuriant pastures. In summer, when the parching heat dries everything out, they are fed with hay in yards or barns. The sunny forest consists of the slender-leaved Eucalyptus, of which the Blue Gum tree is the best known, Melaleucas and other Myrtaceae, the dainty-leaved Casuarinas, Grevillias and Banksias, the Native Pear (Xylomelum), the highly valued Waratah (Telopea speciosissima), the similarly shadeless phylloden Acacias, the Native Cherry (Exocarpus) and so on through the softer Sollya, the beautiful Papilionaceae, Oxylobium, Chlorozema, Daviesia, Dillwynia, Swainsonia, Physolobium, Kennedya and the completely odd Stylidien to the lowest scrub. To me they were all old friends, which, at the time of Baron Hügel’s journey,13 in decorating the greenhouses of Vienna with their splendour, marked the highpoint of garden cultivation and I greeted them joyfully here in their motherland. I could never get my fill of seeing them, so richly bedecked with flowers, luxuriantly wild and growing all around so abundantly that the horses’ hooves crushed that which I was used to regarding as a treasure, and which I myself bent back in order to get at another plant or insect underneath. The foreignness of perfect Cycas macrozamia, which stand in groups in cleared areas, in between the most dainty Grass-trees (Xantorrhoea arborea), with their dark brown-black, foot-thick trunks and often 9-10 feet height, with a similarly high sprays of flowers. Here and there one finds the splendid Gigantic Lily (Doryanthes excelsa), of which I only saw one more in flower. Countless birds, especially parrots drifted around the crowns of the trees screaming, the crane-like Strepera graculina, the white and black Gymnorhina tibicea, the bald-headed Leatherhead, Tropidohynchus corniculatus, the Common Soldier Bird, which is highly valued by all settlers for consuming poisonous snakes, and the carefully protected Laughing Jackass, Dacelo gigantea, countless Finches, the fantailed Muscicapiden, the Climacteris, which climbs up and down trees like our creepers, the 4-5 feet long Monitore, which quickly fled, here and there, to the trees, a prickly lizard, and a beautiful slug guaranteed plenty of diversion. After we reached the mountain crest, we rode along there three hours in a wide circle and, just as the sun was going down, we reached a steep rock wall, where we left the horses behind and climbed further on foot. After a further half an hour’s hike, we were at another rock pile of crude, crumbly sandstone, the actual Sugarloaf, which was very eroded and between the crevices of which we laboriously wound our way upwards and thereby reached the peak at 6 o’clock. A splendid view presented itself to us; at our feet the County of Northumberland stretched around us in the evening light decorated with green forest. Left, in the far distance lay the capital, Maitland, from where the navigable Hunter wound like a silver ribbon luxuriantly through the countryside right down to distant Newcastle, where it wed the sea, whose wild foam sparkled on the distant horizon and on whose waves the ships appeared as just dazzling, white dots on a trembling background. On the right, Lake Macquarie lay stretched out shorelessly, at high tide thickly shrouded all around with forest. My companions described the same as also very poorly accessible, however as a true paradise for hunters since it contained hundreds of black swans, the Australian Stork, Numenius, Sickle Bills, Cormorants and countless other swamp and water birds. The Blue Mountain chain completed the background. The area is fairly well populated and cultivated; numerous columns of smoke showed the spots where the huts of the settlers lay hidden in the woods. My companions were also delighted by this splendid panorama; they had never ascended the peak, although the older of the two, who had been here 15 years, had often come as far as the first wall in search of stray cattle. We could only delay a short time and hurried down to our horses to set out on the return journey. We still did not have half the mountain crest behind us as night broke so clear, so calm and mild as ordinarily only arises in the tropics. The moon rose and poured its silver light down on the pale foliage of the eucalyptus and banksias so that their light-coloured, thin trunks appeared like ghostly figures in the magical illumination. The deep silence was only interrupted occasionally by the piercing cry of a Curlew from the nearby swamp or from the rustling of a Wallaby (Halmaturus walabatus), fleeing on our approach. The giant Kangaroo (Macropus major), together with the natives, has long since withdrawn from civilisation, hundreds of miles deep into the interior. Moved by overwhelming feelings, I was often pleased to let my horse go slowly on the grassy ground. It appeared to me almost like a dream, that I rode here on these plains, where just a short time ago the moonlight illuminated a savage with his spear, creeping up on a shy Kangaroo or an Emu. About midnight we arrived at Ash Island again, from where I returned by steamer next morning to Sydney. 10. Alexander Walker Scott (1800-83), entrepreneur and entomologist, was said to have published over 130 scientific papers during his lifetime. The Scott family moved to Ash Island on the Hunter River in 1846 and from there Scott, assisted by his two artist daughters, carried out various scientific researches, especially with regards to Australian Lepidoptera, or butterflies. Refer Gray (1976) and Ord (1987). 11. It is unclear which steamer Frauenfeld used in his journeys north to the Hunter River and south to Illawarra. He does state that the ‘Maitland steamer’ took him to Newcastle and up the Hunter to Hexham, near Ash Island. As there is no reference to a steaming vessel called Maitland in the Shipping Gazette of that time, he was probably referring to the steamer which accommodated people travelling to Maitland. The Sydney Morning Herald does note that the steamer Collaroy departed Sydney for the Hunter at 11pm on Tuesday 9 November, and this may have been the one used by Frauenfeld. 12. Refers to Alexander Walker Scott’s two daughters Harriett (1832-1910) and Helena (1830-1907). The sisters were extremely skilled natural history artists, and at the time of Frauenfeld’s visit were working with their father on the plates for his book Australian Lepidoptera with their Transformations (1864). Joseph Selleny, artist on board the Novara, also assisted with the cover artwork during his brief stay at Ash Island in November 1858. Refer Ord (1987). 13. Baron Charles von Hügel, Austrian diplomat and natural history collector, visited Western Australia, Tasmania, New South Wales and Norfolk Island between November 1833 and October 1834, observing the flora and collecting seeds and cuttings for his gardens back home in Austria. It was these specimens which Frauenfeld refers to having studied prior to his voyage to Australia. See Dymphna Clarke, Baron Charles von Hügel – New Holland Journal, November 1833 – October 1834, Melbourne University Press, 1994, 539p. Ord, Marion, ‘The Scott Sisters. Art treasures of the 19th century revealed’, Australian Natural History, 22(5), Winter 1987, 194-8. The Bakehouse, Ash Island by Helena Scott (Published by Marion Ord, from original in Australian Museum). Was this located at rear of homestead, compare the pines with the 1858-1861 engraving at top of page. These two illustrations were published in Marion Ord’s book and appear to have both been done around 1859. Compare the two pines in the illustration above in front of the bakehouse building at the rear of Scott’s homestead, with the illustration on the cover of Volume two of the Australian Lepidoptera published in installments from 1890 but executed from 1858-1861. Also see the illustration below showing the palms at the side of the house. THE BOTANY OF ASH ISLAND. (1862, January 27). The Sydney Morning Herald (NSW : 1842 – 1954), p. 5. The plan below (held in the State Library of NSW) is dated 12th January 1864 and shows the footprint of the homestead as well as the pier. It appears to be in accord with the 1858-1861 illustration. I have overlayed the portion of the homestead, orchard and cultivation on current Google Earth landscape. Ash Island 12th January 1864 (Courtesy of State Library of NSW) showing site of Scott’s Homestead, orchard and cultivation. 1864 plan overlay 2014 by Gionni Di Gravio showing contextual position of where homestead and wharf once stood. Closeup of 1864 plan overlay 2014 in Google Earth by Gionni Di Gravio showing position of where homestead and wharf once stood. Compare the above locations and the ones that follow with the best illustration we have of the site, which comes from the cover of Volume 2 of the Australian Lepidoptera published from 1890. Detail showing Residence of A.W. Scott circa 1858-1861 from the front cover of the Australian Lepidoptera published 1890 by The Australian Museum. On the 20 January 1866, Alexander Scott’s wife Harriet, dropped dead unexpectedly on the sofa on the verandah. She was buried in Christ Church Cathedral cemetery. In that same year he became bankrupt and sold the estate at auction on the 27th March 1866. Another map to cross check is this 1871 plan by J.T.Gowlland assisted by J.F. 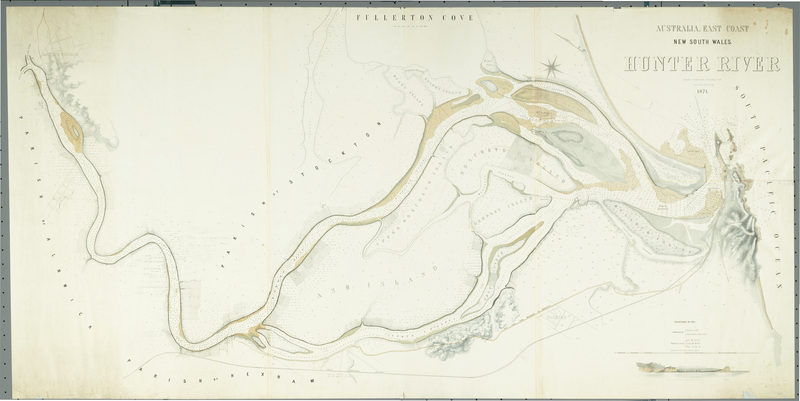 Loxton of the islands of the Hunter River Estuary (held in the National Library of Australia). Again I have overlayed the relevant sections in Google Earth to help pinpont the site of the original homestead and pier. Detail from 1871 map overlayed in 2014 Google Earth showing relative position of wharf and homestead. An article published in the Newcastle Morning Herald and Miners’ Advocate in 1939 The Story of Ash Island (By J.M.M.) Newcastle Morning Herald and Miners’ Advocate, 2 December 1939 p.7 appears to imply that the homestead was demolished at the time of sale in 1866, but this appears to be false, as the pier and spot still appear on the 1871 map, as well as an 1889 land sale poster. The 1946 aerial of Scott’s Point Ash Island below needs to be compared to the  aerial. The aerial below was taken around 1969 and shows building structures on the site, but not in the locations traditionally associated with Scott’s homestead and pier. Were these the structures that were later demolished by 1971, as reported by Deamer? Marion Ord states in her forword to Butterflies & bushland : the illustrated guide to Ash Island butterflies by Rosie Heritage & Julia Brougham, that Charlie Smith (former Chief Librarian at Newcastle Public Library) took her to the remains of the homestead and garden in the 1980s that at the time were ” a pile of dirt heaped up beside the Moreton Bay fig which had also been obliterated”. At low tide, the remains of what appear to be the first row of stones that made up the river wall and original pier can be seen to this day.